Create this middle-eastern inspired dish in just 20 minutes. 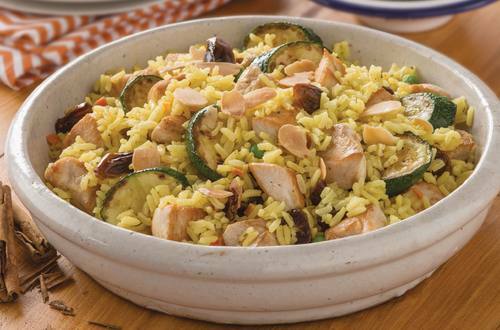 Chopped dates add a wonderful sweetness, and are the perfect partner for chicken and zucchini. 1 Heat oil in a large frying pan and brown chicken and zucchini. 2 Stir in Rice and water and bring to the boil. Cover and simmer gently for 10 minutes. 3 Stir through dates, replace lid and allow to stand for 2 minutes. Sprinkle with almonds before serving.